After we had published the edited volume “Governance across borders: transnational fields and transversal themes“ based on a selection of blog posts in 2013 (the CC-licensed book is available as an on-demand-printed edition, as a PDF and as an Epub), we returned to blogging as usual in 2014. Please find our traditional end-of-year statistics below. In total we published 30 new posts in 2014, which is only half of last year’s 61 and below our self-set goal of blogging about once a week on average. Seemingly, Phil completing his PhD (followed by an offline trecking tour) and myself becoming a father hurt our blogging statistics. 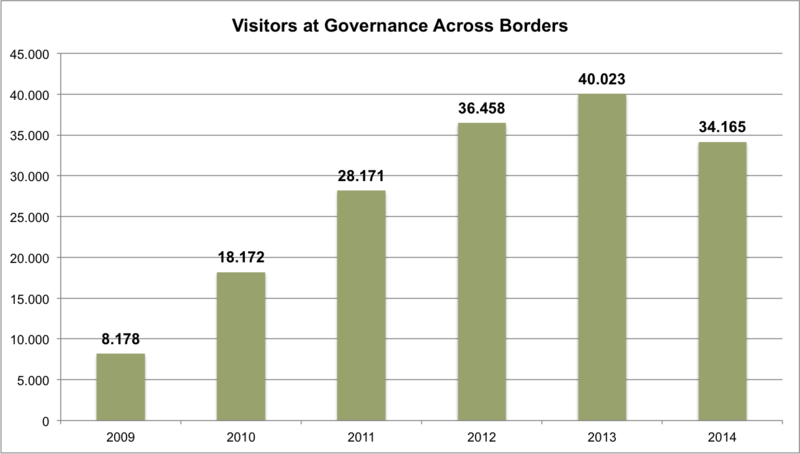 Accordingly, we also received fewer comments and visitor numbers dropped, as well, but not too sharply, from over 40,000 in 2013 to about 34,000 in 2014. Our new year’s resolution is therefore to at least beat our 2014 numbers in 2015.